Have you seen this yet? 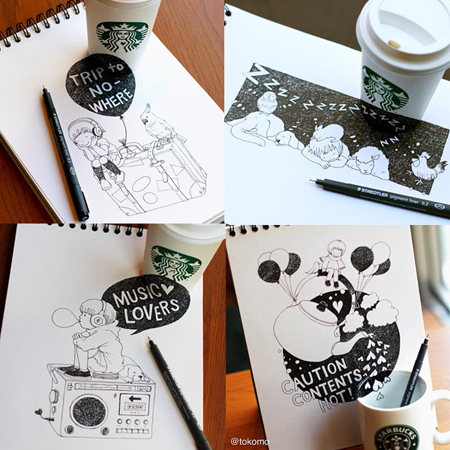 A young Japanese artist is making quite the name for herself by incorporating Starbucks Cups into her drawings to create three-dimensional works of art. Begun as a series of doodles, these drawings are popping up all over the place from Instagram to Facebook, and even the Huffington Post. To some extent this is “pop art” in it’s purest form. Remember Andy Warhol and the Campbell’s Soup Cans. This is Tomoko Shintani and the Starbucks Cups. She is taking an everyday item and turning it into a work of art…using it in a way that it’s never been used before. I applaud the ingenuity and love the 3D art effect she is creating with her drawings. What do you think?